There were birthday travel plans already for Nanjing, when an officemate mentioned that she’d be heading out to Jeju Island in South Korea for a weekend. You know that eye-frown you make when you wouldn’t think that was a real swell idea to go for? I had that, until she told me her budget, and the following facts: plane fare was relatively cheap coming from Shanghai, and a Philippine passport wouldn’t need a visa stamp to visit the island. Then that eye-frown quickly went bug-eyed, and the sense of a good opportunity welled up in my brain. This annual December undertaking of mine won’t be done back home or in China anymore, and the only thing I know about the specific area was fed to me by a movie, which I happen to really like. See, I don’t have a Korean bug (Oh, remember those? ), where I go spastic by anything served by Korean entertainment industry (music, movies, TV dramas). Sure, I’ve had exposure and fascination for their output, but clearly, I’m biased towards the Japanese in this aspect. Putting all that aside, it was just interesting to travel to another country, where I shouldn’t feel guilty because I was, and am, this stubborn overseas worker who makes minimal-to-zero effort to learn the local language, though I did find myself blurting out “xie xie” and “buyao” when interacting with the locals. 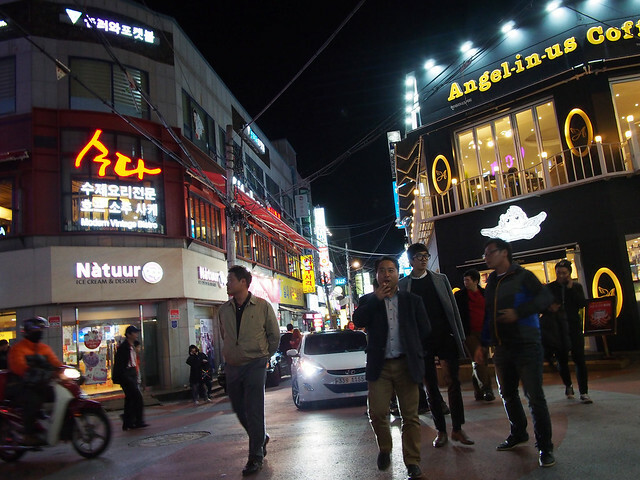 The backstreets of the guesthouse was filled with bars and restaurants, but the first night’s dinner was spent on a streetside hotdog sandwich. I was still tired, and was just looking forward to my non-existent plans for the next three days. After the free prepare-yourself toast and orange juice breakfast the morning after, I told the guesthouse attendant that I will be joining their bus tours for the next two days, and that I will also be watching that NANTA Show my officemate raved about. She laughed a little when I handed over much, much less than what I owed her. Come on, with a conversion like 100.00 CNY = 720.085 PHP = 2,107.50 KRW, any average, number-challenged person is bound to be dumbfounded. 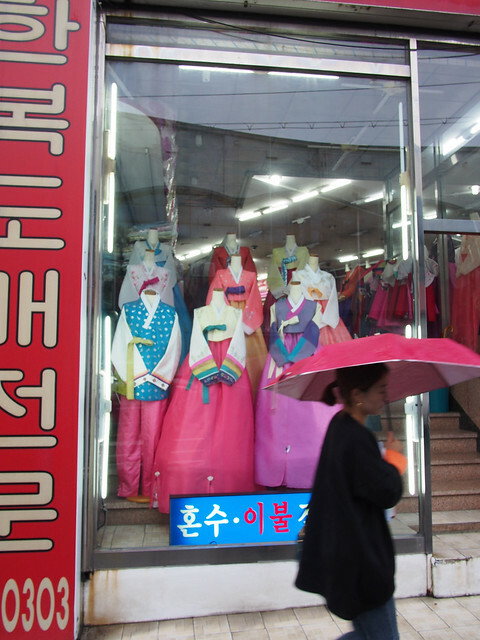 My show ticket actually came with a free, voice-guided bus tour, so I took it, and headed off to Dongmun Market. This was a practice I would like to think I inherited from my father. New to a place? Make a point to visit the local market. 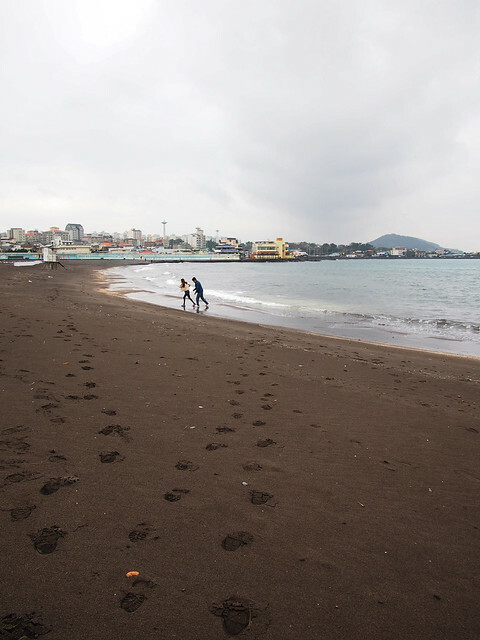 It was a gloomy, cold day in Jeju Island that Sunday, and it started raining after I got off my bus stop. I didn’t see the market right away, and after a 10-minute stroll, I found an area I was thinking of visiting for dinner instead: Black Pork Street. The generous lunch spread I had -from the second restaurant on the left side of the street, which was empty but for me and a dining couple in a corner, since the first restaurant refused lone diners- was had for a reasonable 16,000 KRW. The domestic-bred Jeju black pork was indeed chewier than your normal variety, and there were still hints of black hair on the skin. On the tour I took two days later, we find out how they were fed to merit such a good reputation, the details of which I’ll just link over here. 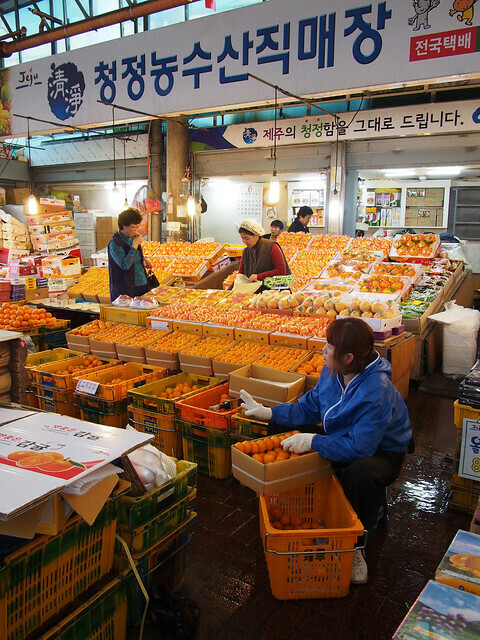 Dongmun Market largely consisted of seafood, and Jeju Island’s signature fruit: tangerine. 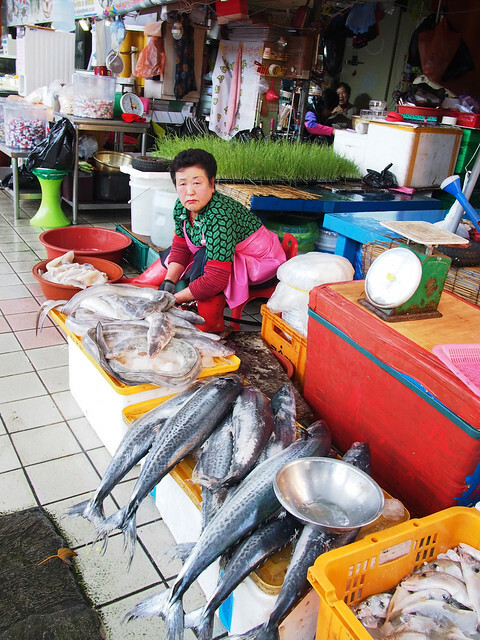 The staple fish seems to be mackerel, and they were abundant, and were sold in all possible sizes. As usual for my trips, I was just following my gut for directions, and since I didn’t subscribe to mobile data (roaming or local), I just went for a bus that I know will lead me back to my guesthouse. I was on the right bus, heading off to the wrong direction. The realization sunk in much later, I was hoping the driver was just taking a detour, but after a few stops, it was more than apparent that we were moving away from the bustling part of the island. I got off at what seemed to be the terminal station, where the Samyang Black Sand Beaches are. There was no breathtaking view, but I haven’t set foot on a coastline for years. The sea-air was rejuvenating, and the absence of beachgoers -but for two couples, and a boy with a dog- sealed a pleasant, welcoming ambience. I didn’t stay too long, since I did have the necessary chore of finding my way back. I arrived at the City Hall area after a persistent hunt for open wifi spots (which seems to be common in the island) to access Google Maps. I don’t remember having dinner anymore at this point, and the only remaining item of that day’s itinerary would be the NANTA Show. I was urged by the guesthouse attendant earlier to purchase the VIP tickets, and I gave in. What is it about? Read here. Show expectations? I just wanted to be entertained, and I got what I asked for. I’m definitely not the target audience -I have a penchant for being snotty, and grossly opinionated, but I’d like to think I’ve eased and loosened up with age- for performances like this. However, the kids a few seats away from me were laughing their heads off, while the grown-ups were visibly enjoying and taking it all in, too. As for me, well, there was the female lead to set my weary eyes on, 송하미. Before bed, I wolfed down half of a just-alright Bulgogi burger, and half a boxful of good-enough soy sauce fried chicken from a Lotteria fast-food joint. I know its not the best of ideas to indulge oneself with food the night before what would seem like a day with lots of hiking involved, but why the hell not.